Tsuya Tsuya. I love that exotic name. A brand from the Orient, it is. It's a Singapore-based brand that also offers other makeup products that include, inter alia, the Angel Eyes range of mascaras and gel eyeliners. According to the website, the founder, known only as Teresa, first started as a distributor of nail files in Singapore and the range eventually expanded to include other nail care products. Later, she started Tsuya Tsuya in 2002 and a beauty and nail salon. Today, its products are also available in a few other countries in the Far East. I bought two of their polishes last year. I don't recall now how much the normal retail price was for these polishes but they were on discount and I paid the equivalent of around €7 each (15ml). 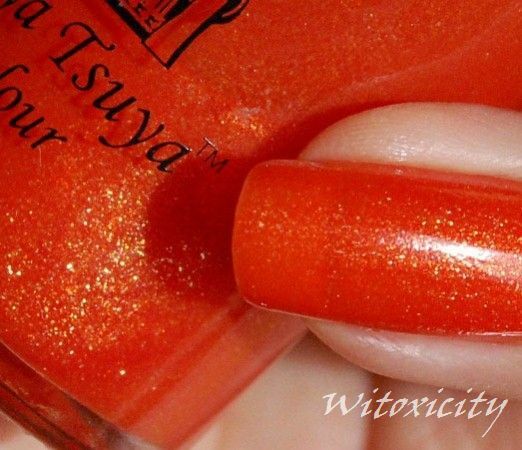 Sunset Glaze is a vivid, juicy orange jelly with gold shimmers. It's probably nothing unique but it's pretty in its own right. Somehow, looking at it makes me think of gorgeous Indian sarees. I did four coats. Application was effortless but I thought it had a very strong smell (stronger than what I'm used to) which, in all honesty, reminded me of Skin Food nail polishes from South Korea. 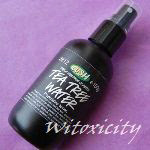 Despite it being a Singaporean brand, it does say on the bottle that it is distributed by Tsuya Tsuya Korea. I can't help but wonder if Tsuya Tsuya uses a Korean formula for its nail polishes. It's quite a hardy polish, I must say. I wore it without a top coat for four full days. No chipping. Wow! That colour is stunning! That has a really pretty finish. Not sure if I like the color enough to pay that much for it though. Conversion rates are hell on my wallet! No chipping after four whole days without topcoat? Can I just say WOW? Pretty impressive! This is a color on you . Haha cool name! That colors looks so pretty. wow, this shade is so beautiful!!! Love it!! Ohmygoodness!! It's just so pretty!!! I have never seen this brand b4. Cute name and I am impressed with the chipping part. Great color!! Where can I buy this brand? You are always introducing new brands to me. I love the gold shimmers in it. love this polish, the color is stunning. You make me lem for nail polishes bad. Uau, essa cor é muito bonita!! Wow, that color is beautiful!! Love, love, love this orange.